Over 6,150 precast components forming 3 hospital ward blocks and main entrance building. The PCE Hybrid structural approach enables the correct choice of structural material to optimise the construction of the building and its use when completed. Offsite manufacturing allows components to be made in factories with permanent skilled workforces to high quality standards. Offsite components forming the four distinct buildings were erected within the 30 week anticipated erection programme. The BHR project involved the provision of 162 high security mental health beds in three ward buildings, an entrance and administration buildings on behalf of West London Mental Health NHS Trust. 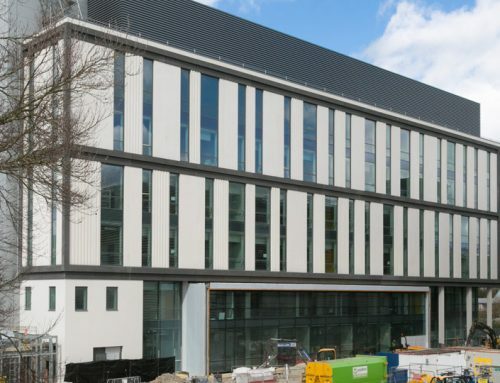 During the tender period in 2014, Kier Special Projects partnered with PCE Ltd to provide economic build solutions for the ward buildings and entrance building. PCE’s expertise in providing predominately offsite hybrid design and build construction solutions for major projects, giving clients certainty on delivery, was well known to Kier due to previous contracts completed. The flexibility in the PCE design and construction processes allows for the selection of the right choice of construction material for differing applications within a building, ensuring that the resultant hybrid structure can be constructed safely to a fast programme and within budget. “Once again the high level of commitment and expertise by all the PCE staff concerned has led to the successful completion by the company of a very complex and demanding project. “We were able to give certainty of programme and quality requirements to our client without diminishing the very high standards of site safety that is so important to the values and ethics of the company”. Where applicable PCE incorporated into the design structural steel and concrete Deltabeams supporting the precast floor units to provide an unobstructed floor soffit, thus maximising the flexibility for installation of pipe, cable and air conditioning ducting runs for M&E services. On average PCE had 60 highly trained company employed operatives on site and up to 3 of its own cranes to ensure that the erection of the precast and steel components along with the associated insitu works was achieved within the 30-week onsite programme. Advanced logistics technology was utilised to ensure that the components were delivered in the correct order to the right crane on a just in time basis thus assisting in the fast construction process. At peak construction times this involved over 60 major components being delivered and erected per day. Due to the sloping nature of the site where the ward blocks were constructed the design team opted for the first lift of walls, basically forming the basement, to be precast concrete twin wall components, as backfilling after construction required a significant proportion to also act as a retaining wall structure. After erection of the twin wall components, insitu concrete was placed within the cavity of the units thus providing an enhanced structural continuity along the walls length. The insitu concrete also contained a propriety waterproofing agent to ensure that the basement retaining wall would be watertight. On completion of the project, PCE held an in house company Project Debrief workshop on site, which gave the opportunity for those that had been involved with the project to fully examine and understand what had been achieved and what the employees had learnt in executing such a large and complex project, so that future projects would benefit from such learning experiences. Over 750 insulated sandwich panels with a factory finished architectural facing ensured consistency of visual external appearance. Working with Kier and their Consultant Architects and Engineers, the PCE design team fully embraced the Building Information Modelling (BIM) processes required for the project. Three Dimensional (3D) modelling was used to ensure that all components were designed and detailed to fit correctly on arrival on site as well as preventing any clashes with other trade contractors activities. 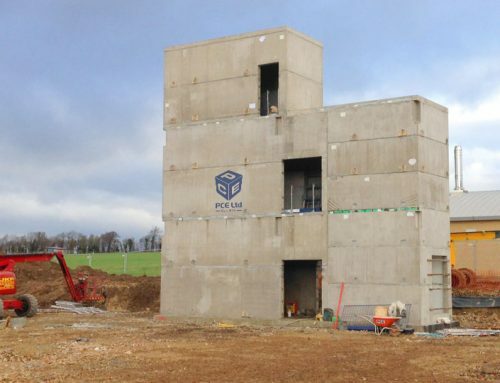 The final design solution meant that PCE were responsible for the design, detail, manufacture and erection of over 6,150 precast concrete units which can be allocated into ten distinct product categories, being: twin wall, solid walls, architectural sandwich panels, prestressed hollowcore flooring, reinforced solid floor units, square and circular columns, beams, stairs and landings. The precast components were manufactured at 6 different factories to the exacting quality control standards required and monitored by PCE.